Peat-free and 100% recycled composts manufacturer, Vital Earth, whose products are made from recycled garden waste, has now launched a specialist Houseplant Compost. This brings the total range to over 30 products, making it the ideal choice for 100% natural, 100% sustainable and 100% UK-sourced green growing media, with every pack bought representing a reduction in our landfill needs. The new Houseplant Compost contains recycled aggregate fines which eases handling, making the filling of small pots and containers simpler and aiding the separation of seedlings and rooted cuttings during pricking-out and potting. The recycled aggregate fines also act as tiny water reservoirs, reducing the need for watering, while the aggregate material itself enhances water-absorption. Vital Earth Houseplant Compost has an excellent shelf-life of more than 12 months, thanks to the slow-release nitrogen properties of added Vitalizer®:Vital Earth’s unique growth booster which carries the memorable strapline, ‘The Aphrodisiac for Plants’®. 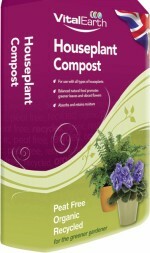 Vital Earth Houseplant Compost is available nationally in a 10 litre packs from £3.49. Bring your senses to life…. 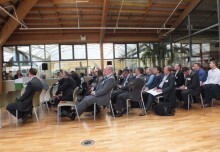 GIMA Day Conference: Opportunities…..they’re everywhere!